Monday, nine days after a deadly tsunami cut a wide swath across Asia, network news stars such as NBC's Brian Williams, ABC's Diane Sawyer and CBS' Dan Rather finally began reporting from the region, a startling length of time given the scope of the tragedy. In Sri Lanka: CNN says that with staffers already stationed in the area, it was able to get there faster. 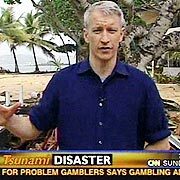 Anderson Cooper is one of 75 on duty. Yet it was probably that scope — 11 nations over 3,000 miles, with parts of countries such as Indonesia virtually impossible to reach — coupled with the giant wave striking during Christmas vacation week that contributed to a slow network news start on the story. "This is one of those stories nobody quite understood in the first couple of days exactly what this was going to be," says ABC News correspondent Bob Woodruff, reporting Monday from Colombo, Sri Lanka. "The White House didn't understand it, journalists didn't understand it, and aid organizations didn't understand it. "Now, more and more reporters are wandering into the story. But everyone was slow to completely grasp the significance." The Asian tsunami is "one of those dauntingly horrible logistical stories to get to," making travel extremely difficult, says CBS News chief Marcy McGinnis. Though CBS and other broadcast and cable networks had reporters in affected countries within hours of the tragedy, they held off before sending their big guns. "There are better uses for an anchor than having him stand in the middle of rubble — with no disrespect to the people who are standing in the rubble," McGinnis says. Rather boarded the USS Abraham Lincoln as it traveled to the region and will report from it for 60 Minutes on Wednesday. He anchored The CBS Evening News from Thailand Monday. CNN's Jonathan Klein says that with producers and correspondents already stationed around the globe, CNN was "able to flood the zone immediately" since last week and now has more than 75 staff members reporting the story. CNN has gone wall-to-wall on the disaster: "We plan to keep our foot on the accelerator — but be very sensitive to when enough is enough." That probably will take some time, Fox News vice president John Stack says. "A story like this has different chapters every two or three days," such as the outpouring of relief from the U.S. government and its citizens. Williams, on his first big story since replacing Tom Brokaw as Nightly News anchor, spent a grueling 48 hours traveling to Banda Aceh, Indonesia, "the hardest-hit of the hardest-hit region," Nightly News producer Steve Capus says. (ABC's Peter Jennings anchored from New York; a respiratory illness kept him from traveling, the network says.) Williams and his producers were vaccinated for malaria, cholera and hepatitis during a weekend stop in Singapore. Capus says it's critical that Nightly convey to viewers stories of hope for the tsunami victims. "If we do story after story that is nothing more than misery, there is a danger of viewers just shutting down because they can't comprehend the enormity of it all." Sawyer reported Monday from hard-hit Khao Lak, Thailand, for Good Morning America on stories ranging from schoolchildren excited to get back to class to a tour of a makeshift morgue. Woodruff says his cameraman noted that this is the first time in years they didn't have to bring flak jackets on a big story. "This is the kind of reporting where you don't make phone calls and set up interviews. You walk down the street and come into peoples' lives who have just gone through horrible events. You just try to put yourselves in their shoes — to see and hear and to some extent feel what they did, and reinvent that somehow on TV."